"Buzkashi" is a kind of national riding sports in Afghanistan. The whips are used more to fight the other riders than to urge on the horse. The simple, turned wooden handle holds a leather "leaf" to which the thong is attached. The thong is a doubled strip of leather with a rawhide plaited 20plt overlay. All seams and fixtures are also done with rawhide. 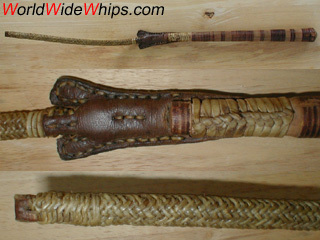 This is an original whip made in the 1970s.